Quests are typically a noble thing: valiantly searching for a magic ring, true love with a princess, that sort of thing. There shall be no obstacle onerous enough to obstruct the ultimate prize—orcs and scoundrels be damned. I, too, have been on my own compulsive quest of sorts ever since I experienced a particular and peculiar dish at a birthday party about seven years ago. The dish was Filipino sisig or sizzling sisig (which is the alliterative moniker I prefer). What is sisig? Traditionally, it is pig head—mostly jowls and ears—that is boiled, broiled, chopped, fried, and finally served on a sizzling platter—hence “sizzling sisig.” White onion, green chili, and Filipino calamansi (a citrus hybrid) are main seasonings. They give the dish a tart and spicy profile. And then some liver is thrown in to broaden the flavor spectrum. So taken was I with the dish that I asked the cook who made it at the party if sisig was available at any restaurants in L.A. She said yes, but cautioned that pig head isn’t always used; sometimes pork belly stands in. I thanked her and was confident that I’d track down an authentic preparation of sisig using pig head. Seven years have passed and authentic sisig remains a memory. Many turo turo eateries—from Pinoy Pinay to Grill City—inside Seafood City Supermarkets do not offer sisig made with pig head. (Turo turo or “point point” Filipino restaurants are called this because they are buffet-eria style establishments where you walk along steam tables and point at the item you want.) One hundred percent of the time, the reason given for why pig head sizzling sisig unavailable is that customers are grossed out by the primary ingredient; pork belly is apparently more palatable. My visit to House of Grill in Granada Hills was no exception. Their sisig consists of pork belly. But I did discover bangus sisig, an alternative seafood version, made of diced milkfish with onions, lemon sauce, and red pepper flakes. It’s a humble plate of mild flavored milkfish with skin, all chopped up, and placed over steamed rice. 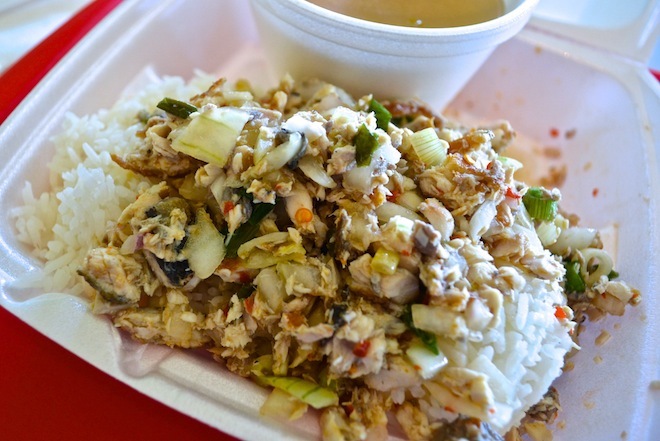 Mostly moist with bits of crispy fish, the concoction is tangy and just slightly spicy. Hit it with some fish sauce to really bring out the bashful flavors.